Thank you to Culinary Collective for sponsoring this post! It’s no wonder paella is the national dish of Spain because this delicious and drop-dead gorgeous dish is simply phenomenal! Valencian paella is a one-pot rice dish that’s easy to make and perfect for casual weeknights, a romantic dinner or for entertaining! Paella, paella, paella…it sounds like a romantic melody. And paella really does conjure up an image of romance, don’t you think? You’ve seen those movie scenes where the guy stops by the girl’s apartment with a bag of groceries in one hand and a paella pan in the other, ready for a romantic night in. One of the most famous of the world’s national dishes, paella – the word deriving from the Old French word paelle for “pan” – is also one of the most delicious with a colorful palette of ingredient options. For the same reason I love Chinese stir fries, paella is such a great medium for adding lots of healthy veggies and you can create any combination under the sun. 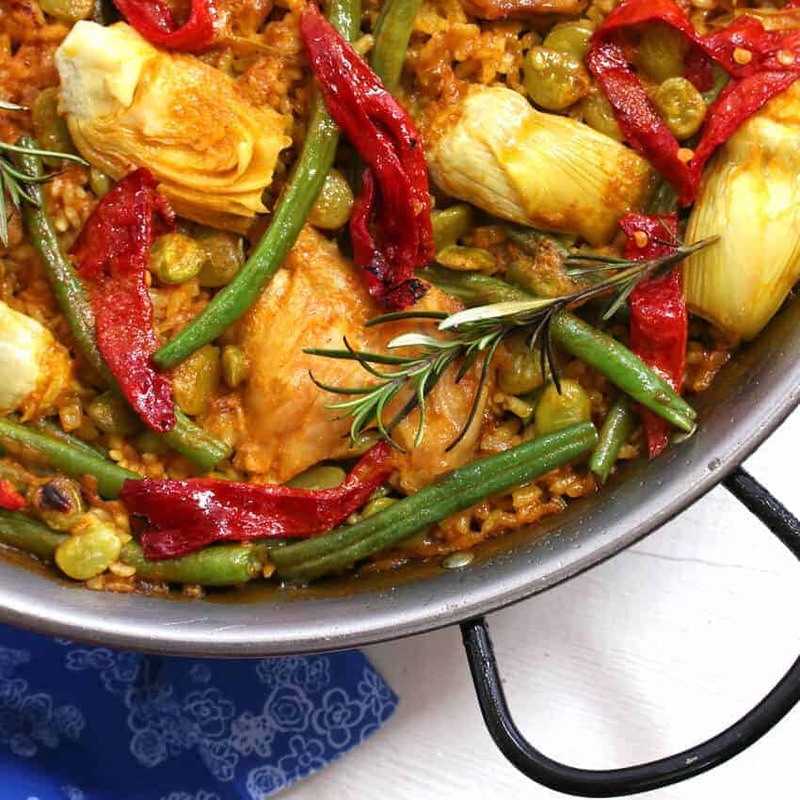 Paella makes for a wonderfully wholesome one-pot dish that lends itself to endless creativity. And paella is just so doggone fun to make! If you haven’t already gotten into the paella groove, you must! 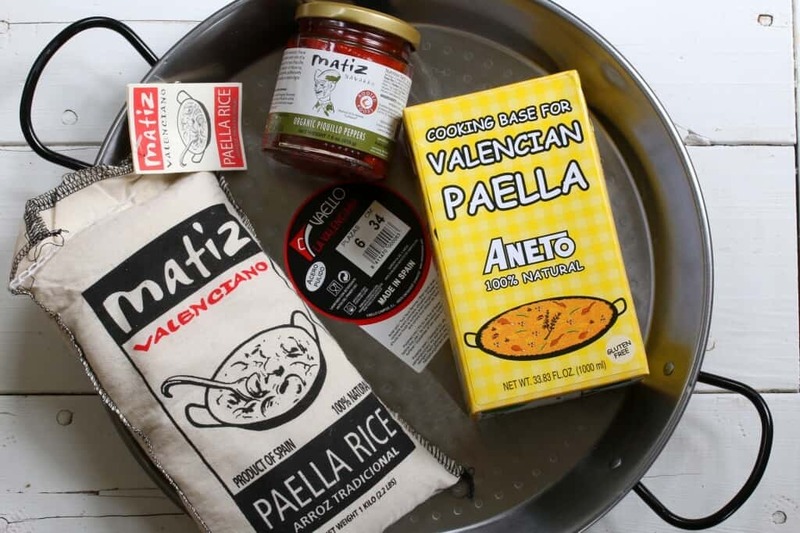 The paella we’re making today comes from Valencia, Spain. We toured Spain last Summer and Valencia was one of our stops. 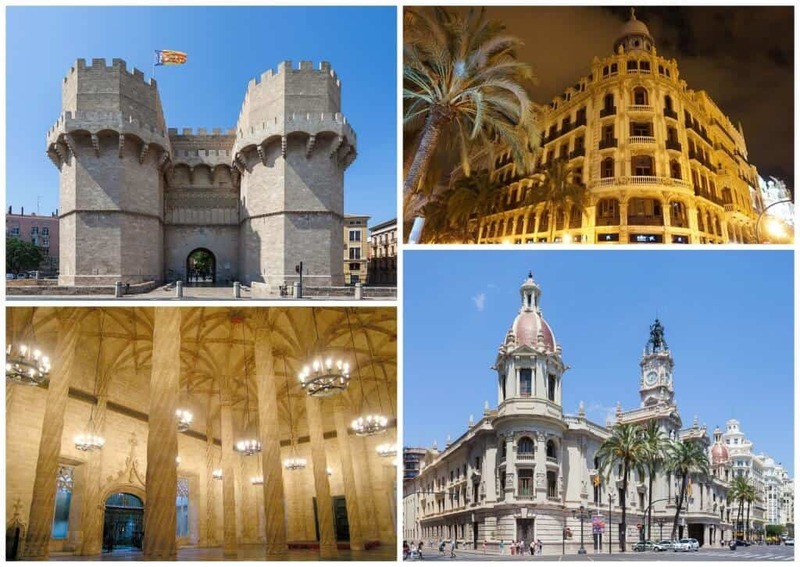 A city with a rich culture and heritage, Valencia is known for its combining of history with ultra modernity. Its beautiful historic buildings are juxtaposed with futuristic structures reminiscent of something in a sci-fi movie. 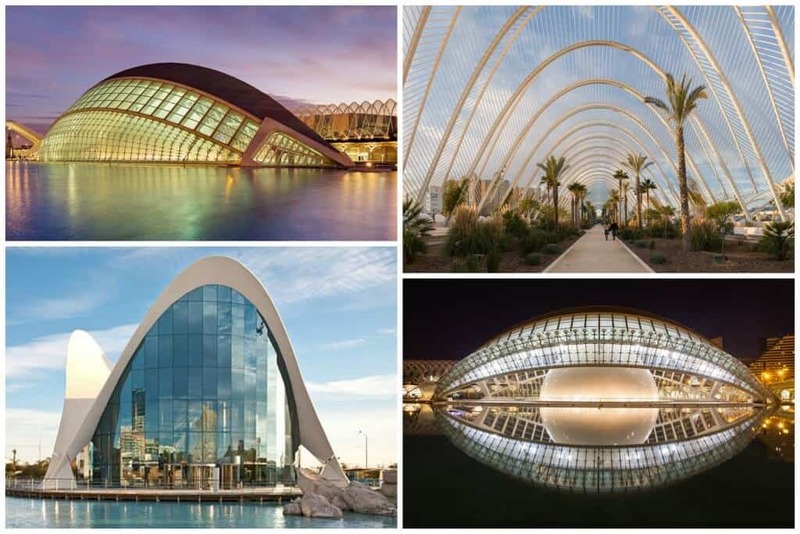 Indeed, Valencia is known as The City of Arts and Sciences. Let’s talk briefly about tradition. A truly traditional Paella Valenciana would include rabbit and snails in addition to the chicken but I couldn’t find rabbit – and I didn’t want to find snails – so those two ingredients have been omitted. Traditional Paella Valenciana also includes a third kind of bean, a white bean, that’s hard to find outside of Spain. But our paella captures the spirit of Valencia with its other traditional ingredients like chicken, beans, artichokes, peppers, rosemary and its rich saffron-colored rice. 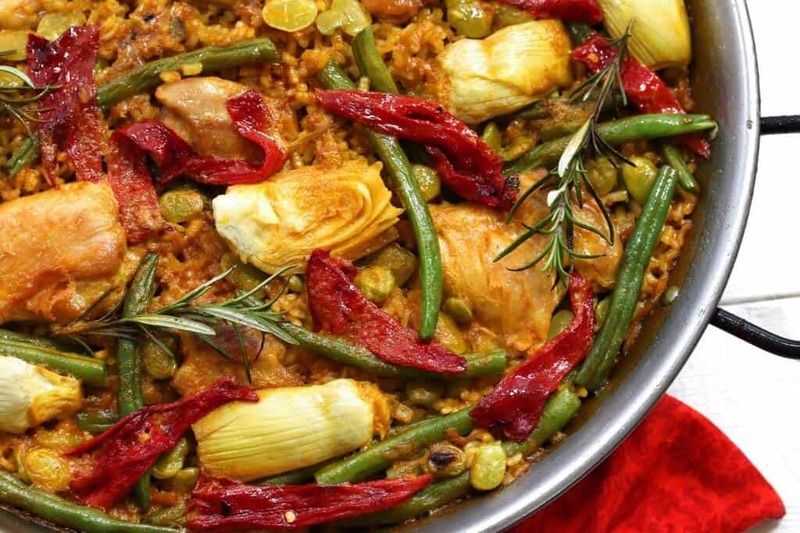 Modern technology has almost completely replaced the traditional open-fire method of making paella, but Valencian cooks have found ways to replicate the flame-kissed characteristics of paella by adding smoked paprika and rosemary (for a woodsy flavor) and adding artichokes to darken the color. Another popular method is to cook the paella on a grill. 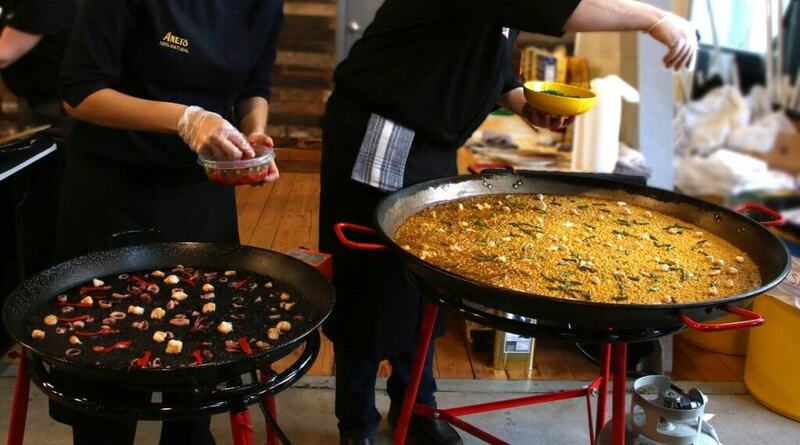 This past weekend I had an opportunity to attend a Paella Party in Seattle sponsored by Culinary Collective, an importer of gourmet cultural foods from Spain and Peru. I was able to meet several wonderful brands in person and sample their products. And I was also able to finally meet the producers of a brand I absolutely love and have been using for nearly 2 years: Aneto. They’re the Barcelona-based makers of my favorite broths. I was also able to soak up some paella inspiration from the Aneto team and dream about our upcoming trip to Spain. 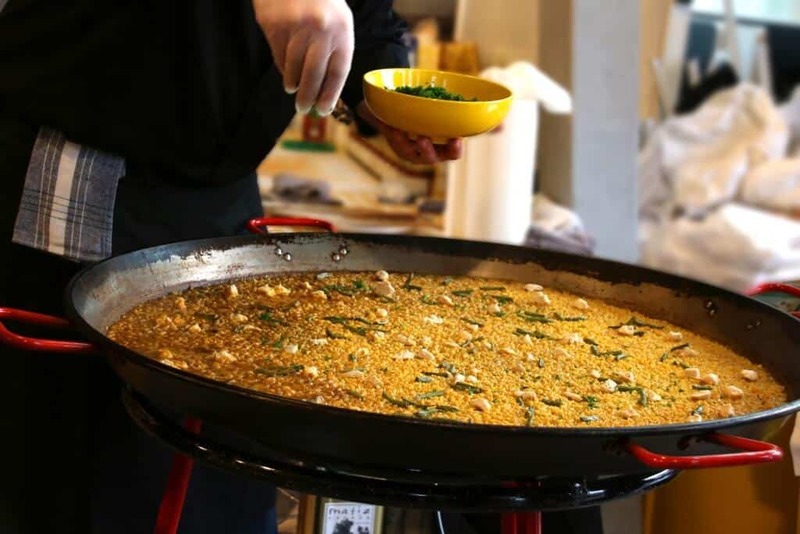 For a dish as famous and beloved as paella, it packs a lot of controversy, even though there’s no clear consensus on the rules of paella-making. At least when it comes to ingredient combinations. Indeed, many of the traditional “rules” are broken even in Valencia. To do so constitutes the ultimate offense and comes with a heavy penalty. Okay, not really. But do not stir the rice. And the reason behind that isn’t just nonsensical tradition. It is the key to paella’s flavor. 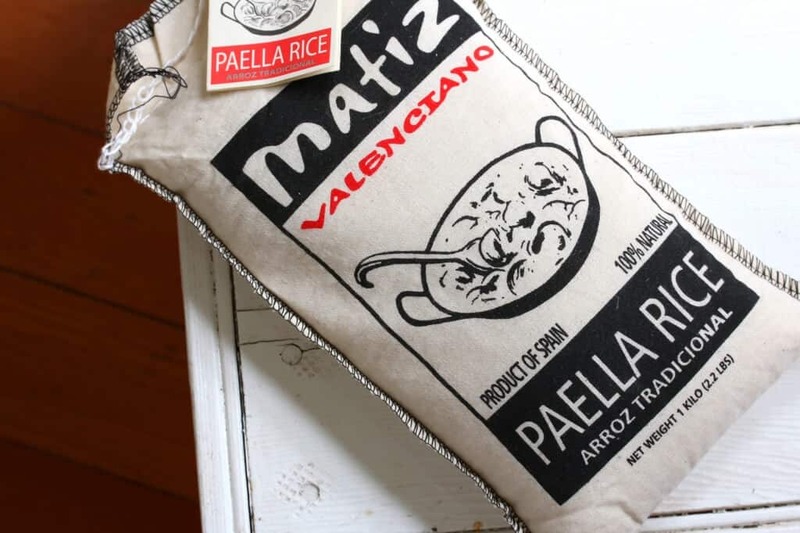 Not stirring allows you to achieve the ever sacred socarrat – that cripsy golden brown crust that forms at the bottom and is the most coveted part of paella. Now that we’ve covered that important base, are you ready to create a paella party of your own? 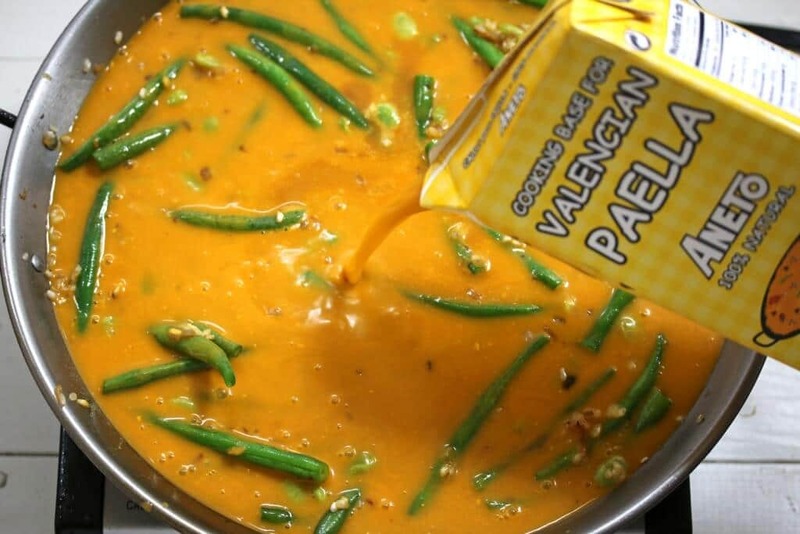 For our Paella Valencia we’re using hands-down THE best paella base you’ll find anywhere. 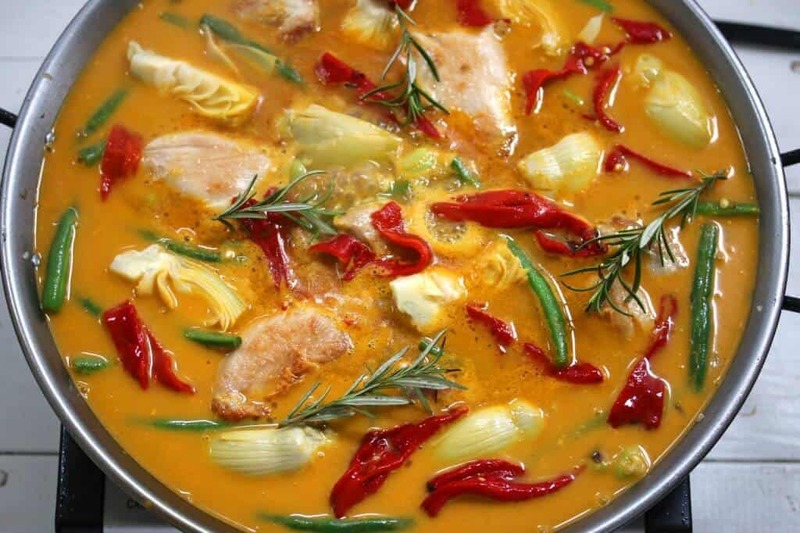 It’s made by Aneto, my favorite broth manufacturer, and it’s an all-natural broth made in Barcelona from the freshest vegetables, meats, herbs and spices and slow-cooked to achieve a flavor that is simply unmatched. No need to add saffron, it’s already in the broth. For more information about Aneto and what sets them apart, join us as we take a tour of their factory in Spain. 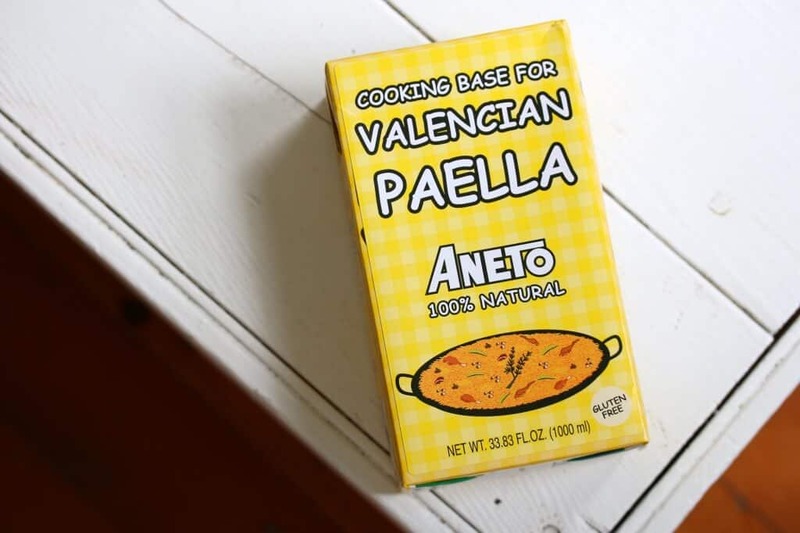 Aneto’s Valencian Paella Cooking Base is amazing and will absolutely transform your paella! 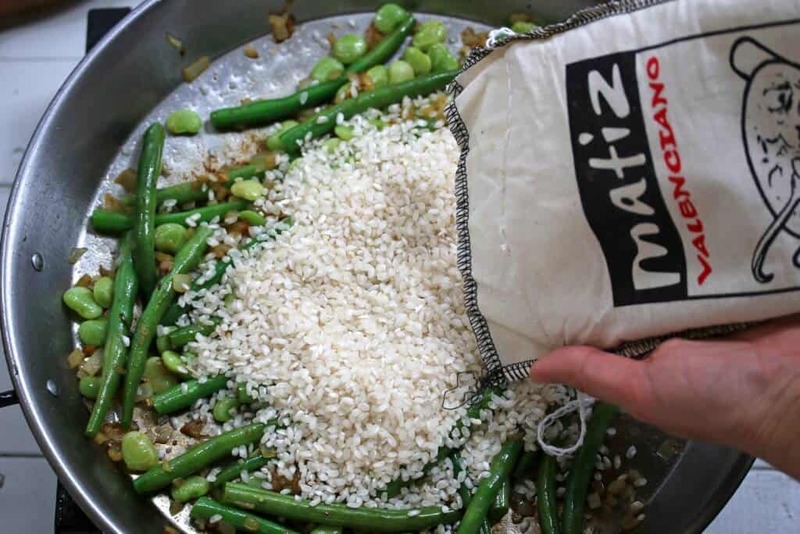 Matiz’ paella rice is grown is Spain and the small grains perform particularly well for paella, yielding a perfect texture and consistency. 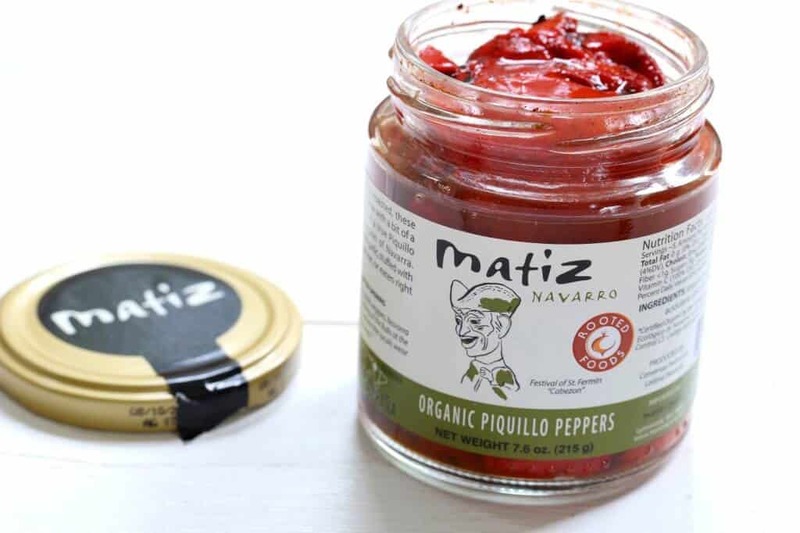 Matiz’ roasted Piquillo peppers are hand-picked in northern Spain and produced without any chemicals. They’re slow-roasted over an open wood fire and have in incredibly rich and complex flavor. I found myself popping several in my mouth while laying them out on the paella. They are so good! You’ll also need a paella pan. 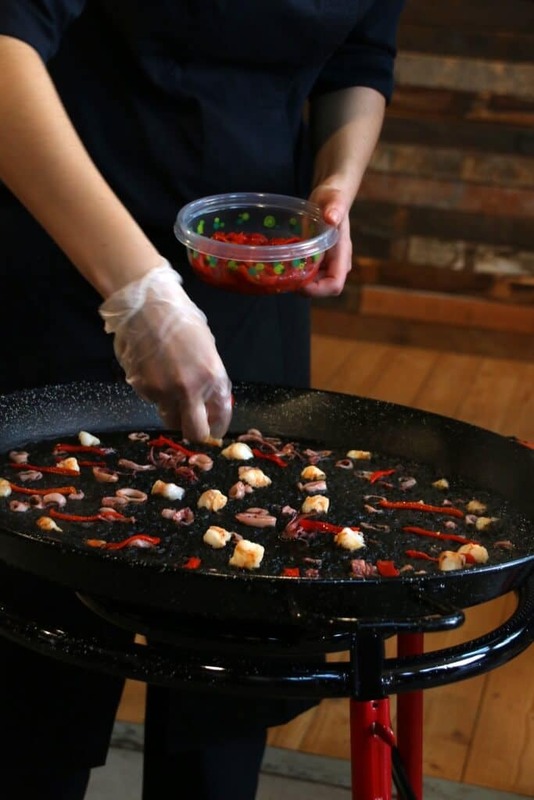 You can use a regular skillet but a paella pan is constructed for optimal results. Some come with dimples on the base for even heat distribution. And whatever size you choose will depend on your cooking surface and how many people you plan to feed. I used a 34 cm paella pan for this dish. Now let’s roll up our sleeves and make some paella! Heat some oil in the paella pan over medium heat, then add and brown the chicken pieces on both sides. 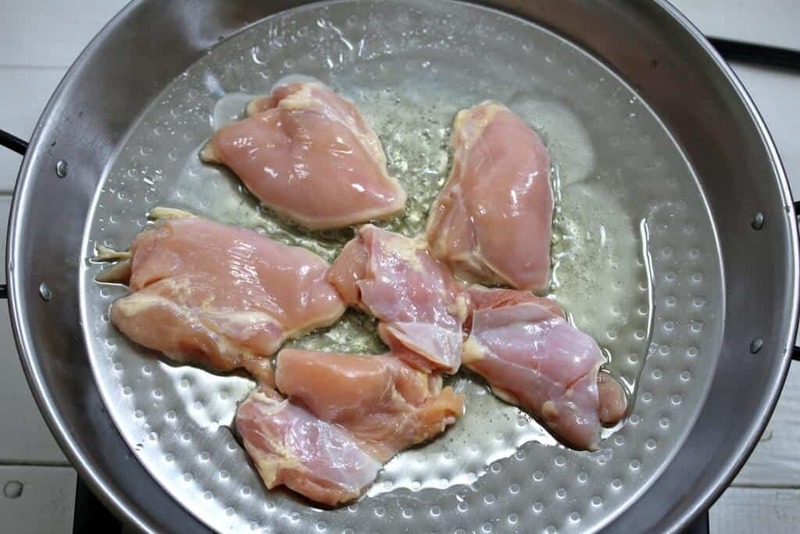 Transfer the chicken to a plate. 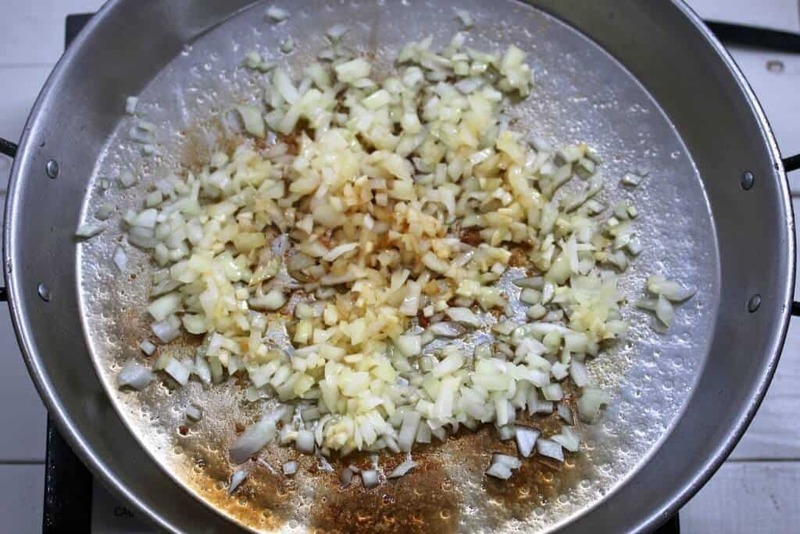 Add the onions and garlic and cook until soft and translucent, 4-5 minutes. 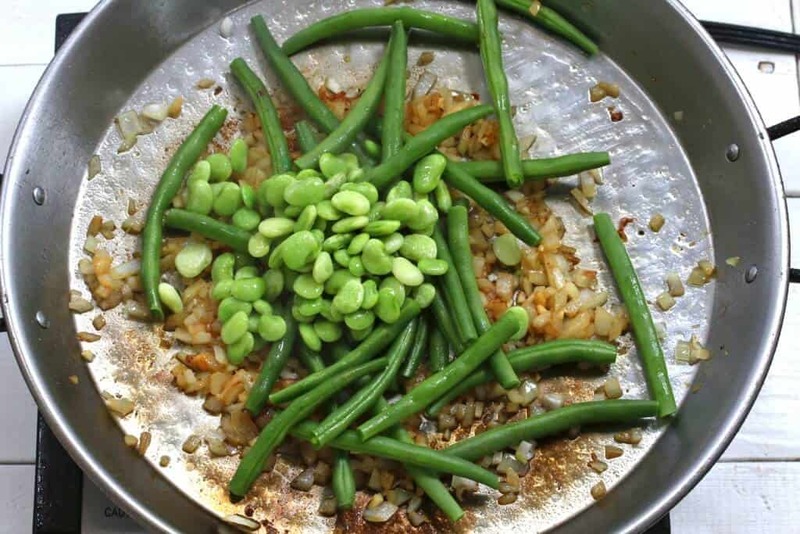 Add the green beans and lima beans and cook for a couple of minutes. Add the paella rice, stir and cook for another 3-4 minutes, adding a little more oil if needed. Add a little salt and pepper. Position the beans the way you’d like them to appear in the final dish. Pour the paello broth base into the pan. Remember the cardinal rule: DO NOT STIR. 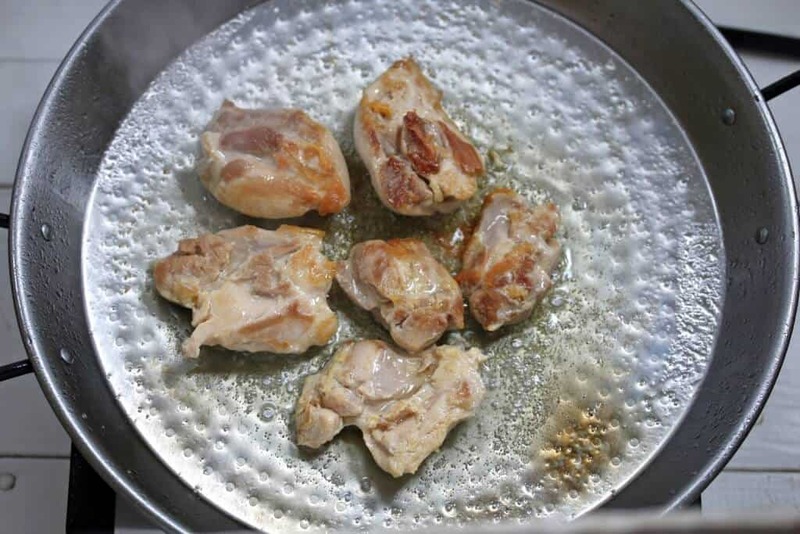 Once the mixture begins to bubble, position the chicken pieces in the pan. Place the artichokes around the pan. Place some strips of piquillo peppers on top. Place some sprigs of rosemary on top. Remember the idea is to position everything the way you want it to appear in the finished dish. Simmer over medium-low heat for about 20 minutes or until the rice is done, rotating the pan as needed to cook the rice towards the outside of the rim. At the end of the cooking you can increase the heat for a few minutes to further caramelize the socarrat, the crispy golden-browned bottom. Place the paella pan on the table and let the party begin! *THIS GIVEAWAY HAS ENDED* Congratulations to our winner, Sharla! CHECK OUT THE “HOW TO” VIDEO TO MAKE THIS DELICIOUS PAELLA! 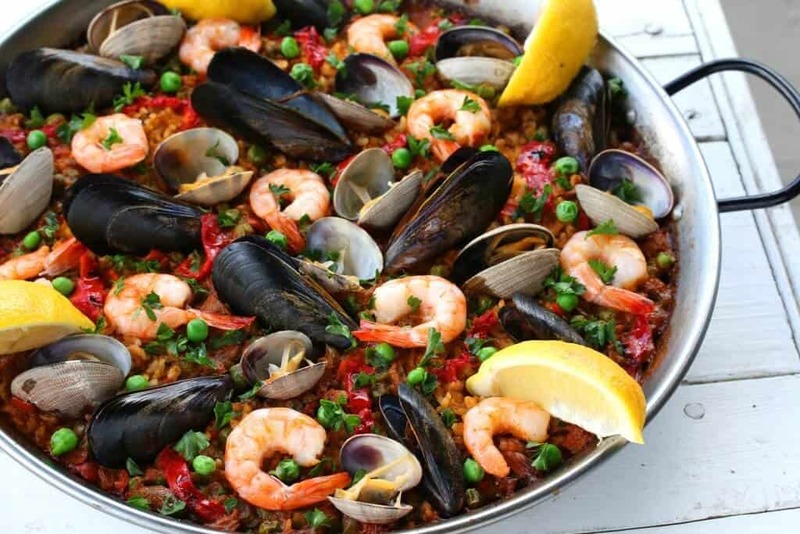 Be sure to also try this delicious Seafood Paella (Paella de Marisco)! 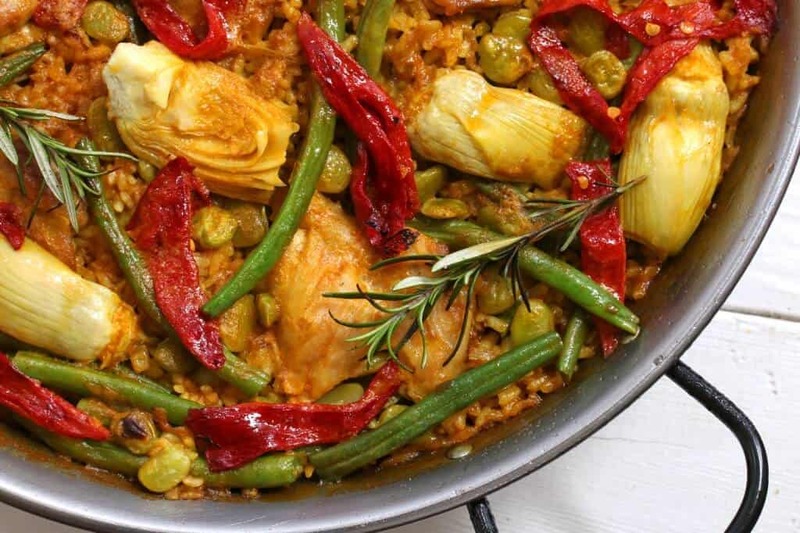 Discover why this delicious one-pot meal is the national dish of Spain! Heat the oil in the paella pan over medium heat, then add and brown the chicken pieces on both sides. Transfer the chicken to a plate. Add the onions and garlic and cook until soft and translucent, 4-5 minutes. 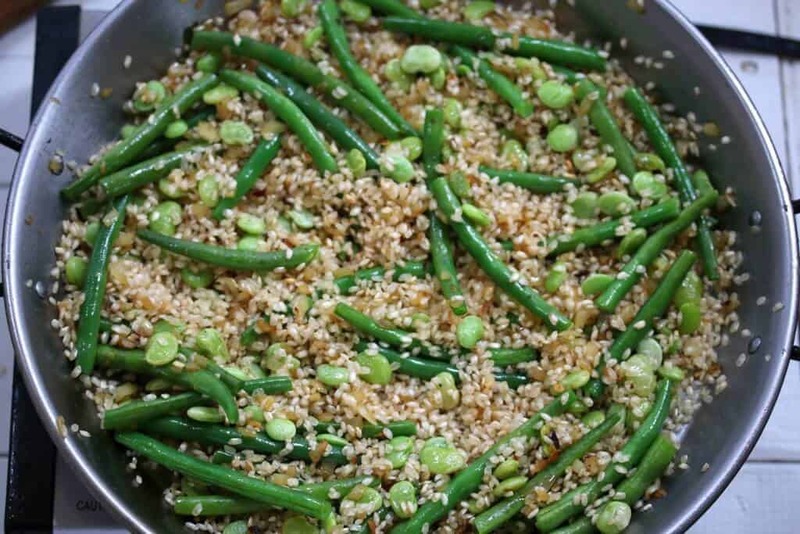 Add the green beans and lima beans and cook for a couple of minutes. Lastly add the paella rice, stir and cook for another 3-4 minutes, adding a little more oil if needed. Add the salt and pepper. Position the beans the way you'd like them to appear in the final dish. Pour the paello broth into the pan. Remember the cardinal rule: DO NOT STIR. 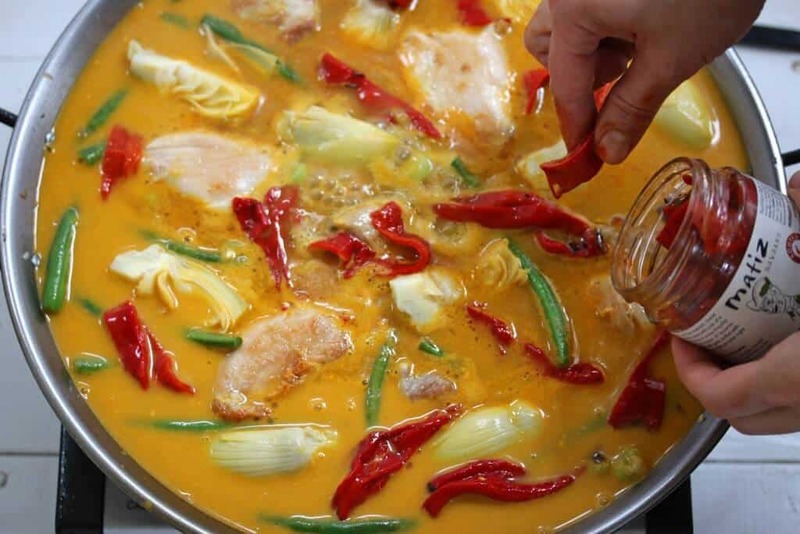 Once the mixture begins to bubble, position the chicken pieces in the pan followed by the artichokes and then top with the Piquillo peppers. Place some sprigs of rosemary on top. Simmer uncovered for about 20 minutes or until the rice is done, rotating the pan as needed to cook the rice towards the rim of the pan. At the end of the cooking you can increase the heat for a few minutes to further caramelize the socarrat, the crispy golden-browned bottom. Sprinkle with some smoked paprika and serve with lemon wedges. If you're using Aneto's paella cooking base it already has saffron in it so need to add extra. Disclosure: Thank you to Culinary Collective for sponsoring this post. This dish is what dreams are made of. Great giveaway. This was absolutely delicious! I followed the recipe exactly and used the Aneto cooking base and not a grain of rice was left! I would love to try paella! Thanks for the giveaway! How awesome is this party?! I don’t understand why someone would stir the rice to begin with but good to know :) This is something I would totally want to try! This looks amazing, so full of both color and flavor! Yum! awesome.. drooling over here.. I love your paella recipe. pinned it. I have watched paella made but never tried it. This looks so bright and colorful! So full of flavor. Thanks for sharing! Lived in Spain and constantly try to recreate such a beautiful dish. Thanks. I LOVE paella. I mean, how can you not? If one of the ingredients isn’t your bag, there’s bound to be something else in there you love, plus it’s just a beautiful, beautiful dish. I’m with you about skipping the snails, though — on a whim, I recently bought a bag of small frozen snails from the local Asian market and popped them into a pasta sauce. No one cared much for the texture. What a gorgeous dish! I have to admit – I have a paella pan and have never used it for paella! But you’ve inspired me to try! I would love to experience this type of food. Looks Great! Oh, how I love paella, but just don’t make it often enough, even though I have a paella pan in my cupboard. You’ve inspired me to change that! This is dumb but I’ve never had paella. I’m a picky eater and thought I wouldn’t like it but after seeing the ingredients, I think it sounds delicious! I am absolutely in love with your whole post. The photos are beautiful and you were so lucky to get to go to the Culinary Collective. That paella base looks dreamy. Entering! This is seriously the most mouthwatering paella recipe that I’ve ever read. I’m not a huge fan of anything that wears a shell, so to say that I’m thrilled that you use chicken is an understatement. LOVE this so much! I LOVE this post and I feeling SO inspired to make paella!!! Your pictures are absolutely gorgeous, your paella looks mouthwatering, and I can’t wait to try it! Thanks so much for this wonderful recipe and all the product recommendations, I look forward to trying the out! Gorgeous photos….and such a gorgeous dish! It sounds absolutely delicious! Thanks for the step by step photos — that demystified this process a lot for me! What a beautiful paella! Your paella is so pretty! For some reason, paella always makes me think of George’s parents in Seinfeld. That looks great. I loved the paella I ate while living in Spain years ago. This looks insanely delicious, it’s been far too long since I’ve had paella! A paella party sounds like so much fun! 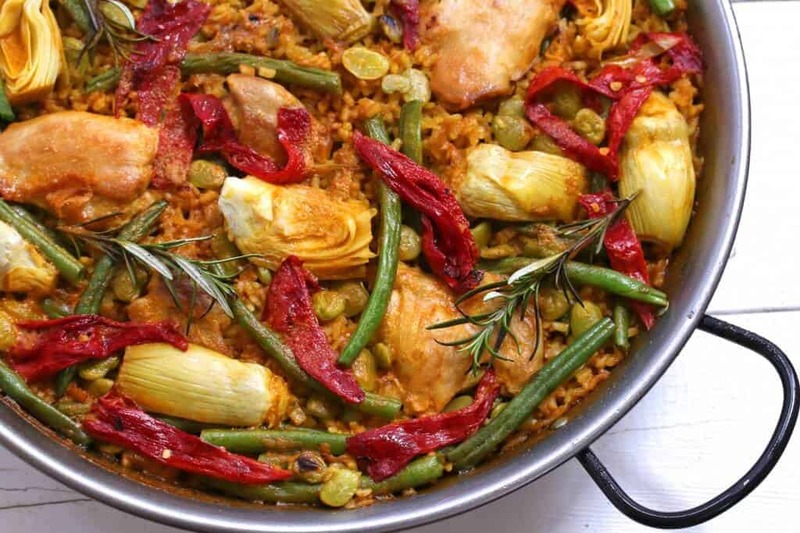 I’ve never made paella, but I need to remedy that…your recipe is gorgeous! I loved the travel photos in this post too. I just LOVE paella! It is such a gorgeous dish and yours is no exception! So many wonderful flavors here! Paella, oh Paella haha it does sound romantic haha. I’ve never made paella but I LOVE IT. I had NO idea that you didn’t stir paella hahaha. I guess it’s a good thing that I read your blog before I tried to make it on my own! Thanks for the giveaway!! Oh man, it looks like a Spanish risotto. Yummmm! Oh my gosh this looks amazing! I love paella and used to make it all the time – you’ve inspired me with your beautiful pictures and amazing recipe, looks just fabulous! That looks amazing! And like something my family will enjoy! Ahhh! I adore a good paella, but I don’t make it nearly enough! Thanks for sharing this with us! We all love paella here…especially my husband. He always gets it when we go to a Spanish restaurant. He would be so excited if we had one of those paella pans…like beyond excited! I honestly always thought paella was too difficult or complicated to make at home, not realizing that it could be done in one pan! thanks for the tips and chance to win. Paella is one of my favorite dishes of all time! I love so many different varieties of paella and I can’t believe I still don’t have a paella pan after all these years. Thanks for the giveaway! I’ve never made paella myself before, but I absolutely love it! This recipe looks amazing! I love my Mom’s paella and that’s the only kind I’ve tried. All of these flavors just sound amazing! I want to try paella because I love all the ingredients and know I would love the dish. These flavors!!! What an awesome dinner! I have eaten a few versions of paella and I have loved every one of them but I have never made it myself. This recipe looks so good and seems very doable. Thanks for the chance to win. Never made nor had this but I’d definitely give it a whirl. It looks really good. I used to cook paella quite frequently, but my pan got lost in my last move. I would love to have another so that I could cook it again! I have never made Paella, and love trying new dishes. Bonus a one pot meal! This is part of my heritage! My mum would make this dish for guests, and it was a hit. I love good food! Your recipe looks wonderful. 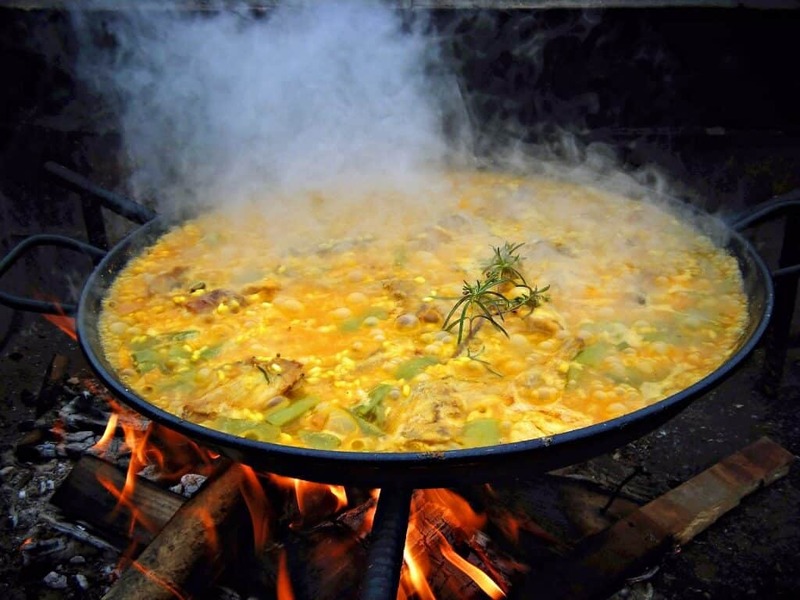 I love cooking over an open fire and paella sounds perfect for a large group. I was always thrown off by the unusual ingredients, but with just chicken for meat I will definitely give it a try. I never had this dish. I sure would live to try it! One pot meals are always welcome. Yum! I want to make paella ASAP, but even more, after seeing your photos, I want to visit Valencia and take the ferry across to Morocco. Thanks for a wonderful write-up. This lovely tutorial (great photos!) makes me yearn to visit Spain AND make paella. Thanks for posting it. I have always been fascinated by Paella! I had the opportunity to have it in Portugal, but I felt it might have been geared towards tourists and was a tad disappointed by it. I want to try it at home. I love the detailed posts you give, along with your pictures. Yours is a favorite blog of mine, thank you for doing what you do! i absolutely LOVE paella & would to have the correct tools to make it…and this version looks AWESOME! Very interesting The way it is made.Would love to make. My husband has been diabetic for many years and I am now pre-diabetic so we have decided to follow the Michael Mosley 8 week blood sugar diet. This is basically a very low calorie Mediterranean diet. Everything that we eat noiw is made from scratch and this recipe looks like a wonderful one to continue our healthy eating plan. Paella is one of those dishes that I can change up depending on what I have on hand, and it’s a one pot meal that’s easy to make and satisfying. 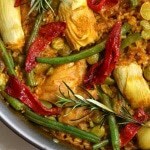 I love the way the flavors of the ingredients in paella all come together to produce a magically delicious dish. My husband lived in southern Spain for a while, and we continue attempting to recreate the paella as he remembers it. A skillet just doesn’t do it justice. Thanks, and cheers to this! My husband & I love paella, but only eat it when dining out because it seems so complicated. Your recipe, with the step-by-step directions and pictures make me want to definitely want to give paella a try. Thank you. Thank you, Daring Gourmet for this lovely giveaway! Thank you from the bottom of my heart, as I was selected winner. I will be sure and share my first attempt at paella in my new pan as soon as I receive this wonderful gift blessing!!! Wow! Nice one! Well done! But as a Valencian paella lover, (I go to Alicante all the years), I have to say that the authentic Valencian paella, doesn’t have onion. That’s because it changes the texture of the rice and make it more glutinous, like rissotto. I’ve tried to find lots of recipes in the Internet and it’s very difficult to find one close to the traditional recipe. Fantastic, Emilia, thank you! Agreed, the Aneto base and the paella rice are everything. So glad you enjoyed this! Thank you very much, Jose, I appreciate that! ¡Buen provecho! 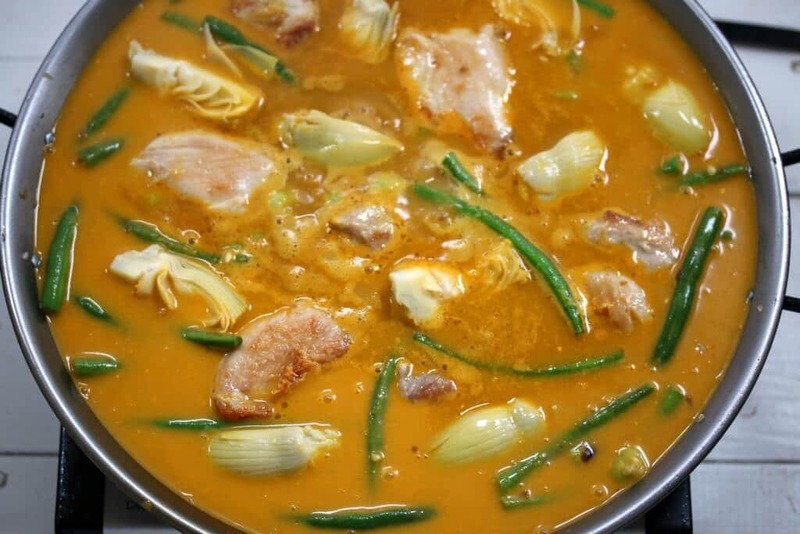 The whole point of such dishes is meat and veggies and rice mixing their flavors. I’m not sure why s1 would fry uncooked rice in oil as in this recipe. Normally crust is formed because paella pan is large and some rice is sitting on the bottom(in oil) and some rice is not. So the browning of the rice does occur either way if that’s the goal. Not to mention the fact that it’s not always all-chicken dish, f.e. commonly used rabbit should be cooked a bit longer – exactly why you add water to the meat after it’s fried. 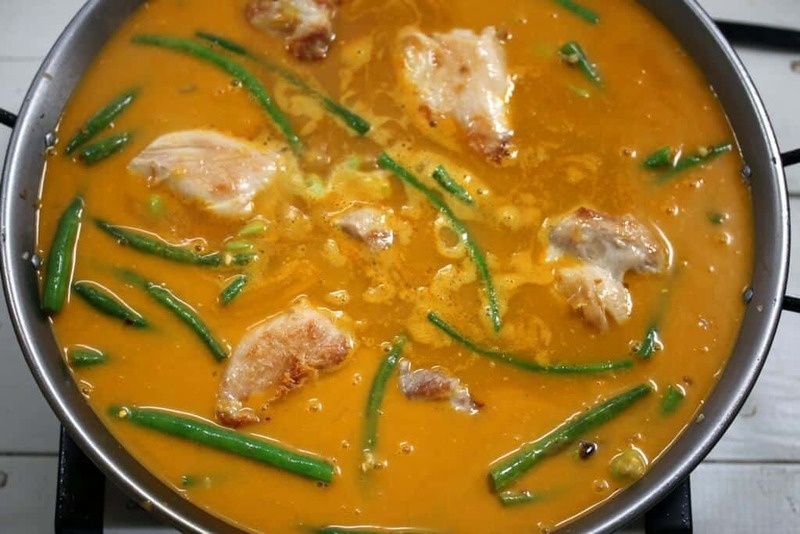 Agreed, I wouldn’t trust everything from Wiki – yes, the meat should be simmered with everything else and yes, as mentioned in my post, Paella Valenciana traditionally incorporates rabbit and snails. Sauteing rice in oil first is a common way to approach cooking rice in general for the following reasons: 1) It helps prevent the rice from releasing too much starch while cooking, 2) Helps prevent the rice from sticking together, and 3) It helps improve the texture of the rice by preventing it from becoming mushy. I was so glad to discover your site AND find your Paella recipe. WHY? First, I love to cook and especially like your recipe pictures. Second, I am so “tired” of my husband of 31 years talking about Paella, and why can’t I make it someday (I’m sure he is kidding-maybe). He went to Europe while in college and tells me at least once a month about the Paella he had in Spain! He loves to cook also, but he has been as hesitant to make Paella as I am. He is such a good guy that I would like to make your recipe as a surprise for our anniversary. He loves Pistachio ice cream and might try that recipe also. This will not be until end of April but I will let you know how it goes! I have no access to your stock base Aneto. What else can I use ? A good chicken stock is also elusive but I could make my own. Hi Paul, yes, a good chicken stock is a must and add a pinch of saffron to the stock. Hi Kimberley, my name is Mayte and I come from Madrid (Spain). I must congratulate you for your wonderful paella and your interest in trying a real one. It’s difficult to find a good paella outside Valencia, but yours looks great. Even heat is crucial. Another sin often committed is the covering the dish with foil. The rice needs to cook in the broth not steam in the vapors. Definitely, Jeremy. Also, rotating the pan helps ensure an even crust on the bottom. Tin foil: That’s generally just done for seafood paella at the very end so that the clams and mussels can steam and open up. Definitely your paella valenciana is awesomeness! This is a great recipe Kimberly, as you know I made it a short while ago and it was lovely, in fact have made it again since. Thx for sharing recipe, i definitely add it to my cookbook! It took me a few days to order all the ingredients but the wait was well worth it! This paella is EXCELLENT! No need to look any further for recipes, this one hit the jackpot. Looking forward to trying your seafood paella next (already have the Aneto broth). Thanks, Kimberly! Wonderful, Tim, I’m so happy to hear that, thank you! I’m confident you’re going to love the seafood paella too. Aneto’s broths are amazing! This paella valenciana absolutely something new for me! Looks yummy! Thx for sharing recipe, I definitely add it to my cookbook! Hello Kimberly, a wonderful chicken dinner recipe. I will share with my Facebook account. thank you. Thanks, Kimberly. Great recipe and step by step instruction. I’ve been making paella for years, usually over a wood or charcoal fire, and am a bit of a perfectionist with technique and respect for tradition. But with all things adapted to a home kitchen I find a little ingenuity and “intelligent disobedience” may be in order. Most especially important is getting a uniform cooking across the pan on the small burners characteristic of American stoves. 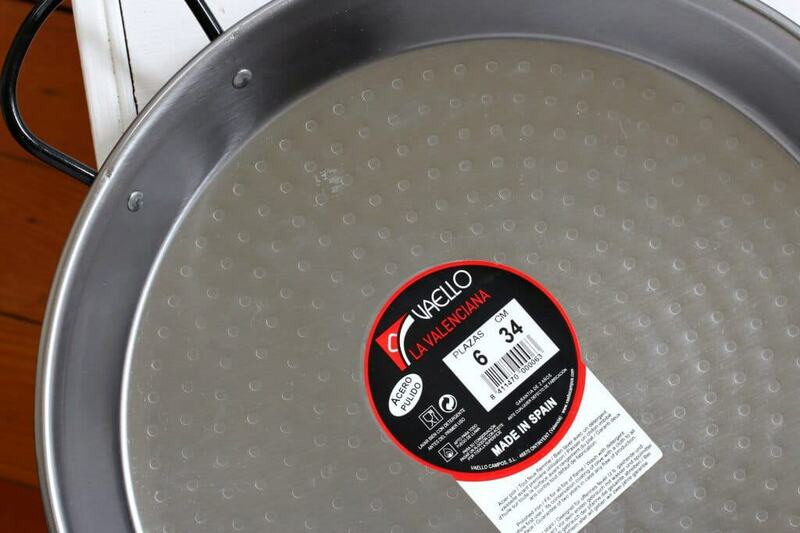 First, I support the pan on a wok ring (for indoor cooking I favor a 15 inch Pata Negra pan) – – the wok ring elevates the pan to receive a broader heat source for more uniform heating. Secondly, just before the rice is halfway done, I fold the rice from the edge of the pan to the center, and the rice from the center out to the edges . . . this may contradict the “no stir” policy, but results in more uniformly cooked rice while still allowing more than enough cooking time for a proper succarat to form. Hope others may find these indoor paella cooking tips helpful. Hi Robert, I can definitely appreciate some “intelligent disobedience”, thanks for the tips! Hi, I haven’t tried the recipe yet, but just came home from 4 weeks in Spain and wanted to recreate paella! We did not go to Valencia, but spent our time in Andalusia, where the paella is probably not as authentic, but I don’t think any of our paellas had any type of beans. Many North American recipes add green peas, which I know is not authentic. I’ll add garbanzo beans, because they served them often in Andalusia, and because I love them. I don’t have a paella pan, so I’ll use my well-seasoned cast iron fry pan, and I will try not to stir, but that will be difficult! Thanks so much for this recipe! Hi Sandra, yes, you’ll see many variations across Spain. We covered 3000 miles on our last trip and everyone does it a little differently. 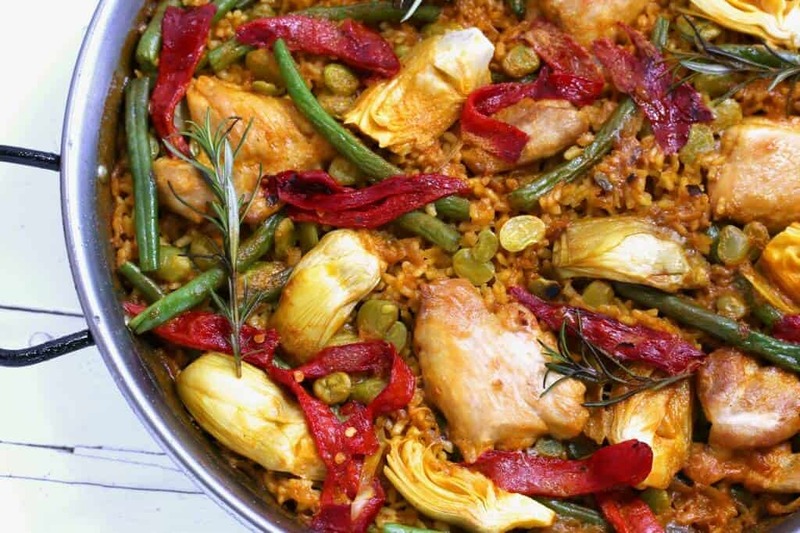 This recipe presents a very traditional Valencian paella, minus the snails. Paella is a lot of fun to make and eat, I hope you enjoy it. And your choice to spend your time in Andalusia was a great one. We fell in love with southern Spain in particular. I made your Paella Valenciana recipe tonight. It was delicious! This is the second time I’ve made a paella. The first time was years ago, and that turned out well, too. That time I made it a little differently with at least one different bean and my proteins were actual snails (no shells) and duck (I couldn’t get rabbit at the time. I don’t remember if that time I achieved a socarrat. This time it didn’t quite happen. Is there a way I might make it happen when reheating the leftovers? I’m going to refrigerate it overnight in the pan. I did not use an authentic paella pan, but used a 12″ fairly shallow stainless steel pan. Maybe if I add a bit of olive oil to the leftovers and then heat it on a medium-high temp then turn down the heat to low and cover it with foil for a bit to heat the rest? Only my husband and I ate it tonight. I’m so glad you enjoyed it, Elaine, thank you! Yes, that’s probably the best way to see if you can get the crispy bottom on the leftovers.